It’s Hugh Manatee reporting in with 2017’s first summer dispatch. We like to do things a little differently here in our tropical paradise, which includes beginning the summer on May 1. That’s right – a whole month early. Why not? You might be wondering what a Belizean summer looks like, given that our weather forecast is warm and sunny pretty much all year round. The temperatures actually remain fairly similar to what we experience throughout the rest of the year. Things do get a bit more humid, so you’ll want to switch on the air conditioning or enjoy the peninsula breezes. “Belize” it or not, summer is the off-season here, because in addition to the humidity, it’s when the rains creep in to keep our rainforests and jungles looking lush and green. But don’t expect to lose your vacation to it: generally the heaviest rain will keep its distance until about September or October. That gives you plenty of time to fit in a lazy jaunt to our tropical paradise! Now, a lot of our wonderful country’s economy is built on tourism, so things do slow down a little bit in the off-season. While you’ll still be able explore our wildlife sanctuaries, snorkel in the crystal-clear waters or chow down on some freshly caught seafood, some restaurants and businesses may decide to shut the doors if things get really quiet. It’s a good idea to call ahead or make reservations if you want to ensure that things will go as anticipated. Of course, if you like things laid-back and quiet, the off-season is the perfect time to come and visit. While Lobsterfest, now in its 10th year, adds some hustle and bustle, summertime means that you can stroll the sunny boardwalk, wander the pristine beaches and go wildlife spotting in peaceful tranquility. We’ve touched on the fact that Belize gets pretty humid during the summer months, which means that you might want some humidity-friendly activities. This little manatee recommends a paddle in the sea or river for a quick cool-down, but there are plenty of other fun ways to beat the heat. Exploring the waterfalls and caves of Cockscomb is an exciting way to cool off – and tubing down the river is about as good as it gets. Night tours of the Belize Barrier Reef or the jungle let you explore the local natural beauty without the heat, and as a bonus give you rare access to our nocturnal wildlife. But it doesn’t all have to be outdoorsy adventure. Some find summer the perfect excuse to subsist exclusively on Tutti Frutti’s world-famous gelato, while others opt for a chilled Belikin, some ginger beer or even a slice of Belizean cold cake. 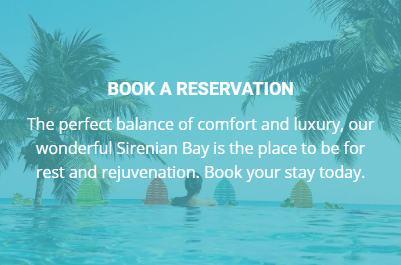 Here at Sirenian Bay, those hot, humid days are the perfect excuse for staying indoors and enjoying a good meal, some great conversation and a game or two. Whichever you pick, it’s safe to say that our so-called off-season has it going on!